So.. wow.. pancakes...Here in Switzerland you don't eat pancakes for breakfast... it's not as popular as in the usa or so... either!! So.. pancakes it's a "holiday food" for me... When we were in the Dominican Republic we ate a lot of pancakes... so... let's bring the holiday feeling to the cold Switzerland! There are many possibilities to make pancakes. You can make the classic one or with apples, blueberrys, wholemeal-pancakes..and so on! I tried today for the first time the Classic Pancakes! They're delicious!! Oh ya.... I have the recipe for Strawberry butter..but I took cherrys instead of strawberrys.. also delicious! So for the butter you can take these berrys or fruits which you like! Oranges, blueberrys, raspberrys, cherrys,... There are no limits! So... let's go and cook them... it's very easy and you don't need much time! Cherry Butter: So.. I first made the cherry butter... because you have to cool it down in the fridge! 1. Mix all the ingredients creamy. Fill it in little bowls. Put it into the fridge and serve it with the pancakes. (Delicious on pancakes, waffles, french toast or just on "normal" toast. Classic Pancakes: for 10 pancakes (depends on the size) 1. Mix all dry ingredients and all liquid ingredients separately. 2. Add the dry ingredients to the liquid ingredients. Attention!!! Don't overact with stirring - otherwise they'll get adamant! It doesn't matter if there are some flour clots. 3. Butter the pan. If it's hot enough (splash some water into the pan...if it's hot enough it sizzles) it's ready. 4. Give 2-3 tablespoons of the dough in the pan. The pancakes shouldn't touch each other! (You can make them as big or small as you want!) 5. 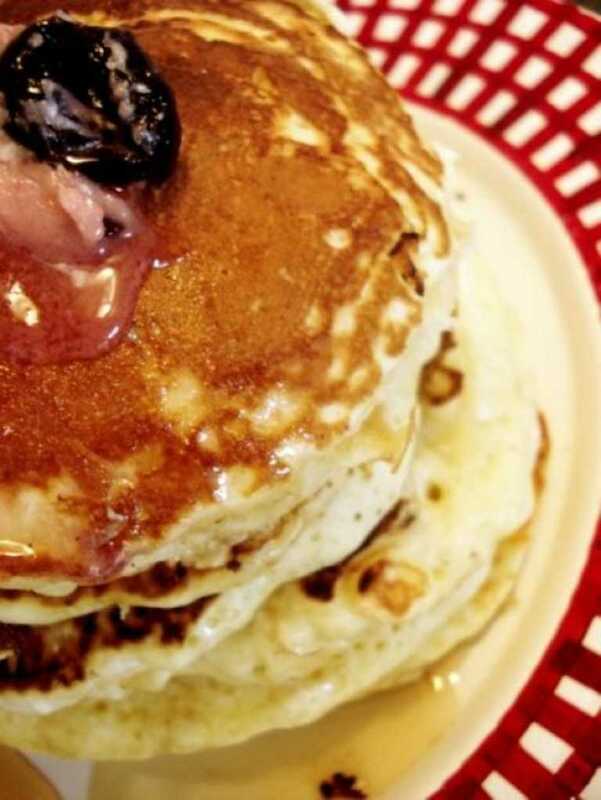 Wait till the pancakes blubbling on the top - then you can turn them around. Don't turn them just around for many times!!! Just once... wait enough long till you turn them...Look if they're already goldbrown on the underside...then turn around! If the 2nd side also goldbrown take them out and put them into the oven to keep them warm till you will serve them. 6. Serve warm with the cherry butter, maple sirup and powdered sugar. You will love it!